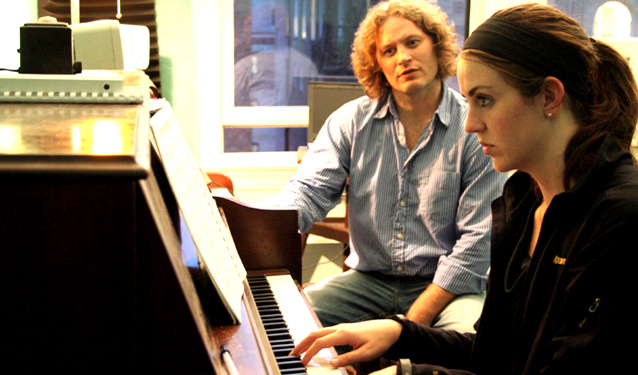 Page Music Lessons is the ideal choice for adult music lessons in Boston. Take a tour of our lesson rooms on any given night and you’re bound to find working professionals, college students, retirees, and music hobbyists intent on improving their musicianship. Many of the parents who bring their kids in sign up for their own lesson plan. Our staff of versatile music instructors understand the challenges facing adult students, and they utilize their years of experience to help you achieve your goals. Some of our students use their lessons as a way to relax, or get some “me time”. Others recognize that music study helps keep their brain sharp. As J. Lipman writes for the NY Times, “Look carefully and you’ll find musicians at the top of almost any industry. Many high achievers told me music opened up the pathways to creative thinking. And their experiences suggest that music training sharpens other qualities: Collaboration. The ability to listen. A way of thinking that weaves together disparate ideas. The power to focus on the present and the future simultaneously.” And if you’re a retiree, read this. With our convenient location right on Boston’s famous Newbury Street, you’ll be able to fit your music lessons into your busy lifestyle. Our adult music students attend their lessons after work, or some drop in on their lunch hour, and others schedule weekend times. After your lessons, you can enjoy all that Newbury Street and Boston’s Back Bay have to offer – catch a show at Berklee Performing Arts Center, enjoy world-class shopping, or stop by cozy coffee shop. And best of all you’ll find easy access to Storrow Drive, the Mass Pike, and the Hynes T stop is just a half-block away. I am really enjoying my lessons. I am learning so much more in the two lessons I have taken. For example, breaking old habits by continuing a song after making a mistake, learning more chords in a short time and willing to take my playing to the next level. Looking forward taking more lessons!